Square Enix announced today that the latest installment in the Tomb Raider franchise will be available on Windows 10, Steam, and PS4 in 2016. Shortly after it was announced that Rise of the Tomb Raider, the newest upcoming entry in the Tomb Raider franchise, would be an XBox exclusive title, Phil Spencer, the head of Microsoft's Xbox division, clarified that it was a "timed exclusive" deal, with little information revealed as to what the time-frame would be. In a press release today, Square Enix filled in the blanks. 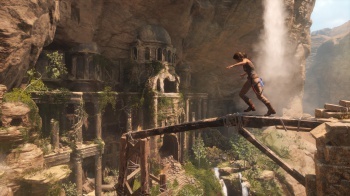 Rise of the Tomb Raider will be available on Windows 10 and Steam "in early 2016," the press release states. In addition Rise of the Tomb Raider will maintain console exclusivity for XBox One and XBox 360 for one year, with a PS4 version being made available during the holiday season of 2016. "In the critically acclaimed Tomb Raider, Lara Croft survived a harrowing experience only to be discredited as part of a cover up," the synopsis reads. "Now, after uncovering an ancient mystery, Lara must explore the most treacherous and remote regions of Siberia to find the secret of immortality before a ruthless organization known as Trinity. Lara must use her wits and survival skills, form new alliances, and ultimately embrace her destiny as the Tomb Raider." Rise of the Tomb Raider will premiere on Xbox One and Xbox 360 on November 10, 2015. Until then, you can re-enjoy the gameplay demo from E3.